Mardi Gras (/ˈmɑːrdi ˌɡrɑː/), or Fat Tuesday, refers to events of the Carnival celebration, beginning on or after the Christian feasts of the Epiphany (Three Kings Day) and culminating on the day before Ash Wednesday (known as Shrove Tuesday). Mardi Gras is French for "Fat Tuesday", reflecting the practice of the last night of eating rich, fatty foods before the ritual fasting of the Lenten season. Some think Mardi Gras may be linked with the ancient Roman pagan celebrations of spring and fertility such as Saturnalia, which dates back to 133–31 BC. This celebration honored the god of agriculture, Saturn. It was observed in mid-December, before the sowing of winter crops. It was a week-long festival when work and business came to a halt. Schools and courts of law closed, and the normal social patterns were suspended. The festival season varies from city to city, as some traditions, such as the one in New Orleans, Louisiana, consider Mardi Gras to stretch the entire period from Twelfth Night (the last night of Christmas which begins Epiphany) to Ash Wednesday. Others treat the final three-day period before Ash Wednesday as the Mardi Gras. In Mobile, Alabama, Mardi Gras–associated social events begin in November, followed by mystic society balls on Thanksgiving, then New Year's Eve, followed by parades and balls in January and February, celebrating up to midnight before Ash Wednesday. In earlier times, parades were held on New Year's Day. Other cities famous for Mardi Gras celebrations include Rio de Janeiro; Barranquilla, Colombia; George Town, Cayman Islands; Port of Spain, Trinidad and Tobago; Quebec City, Quebec, Canada; and Mazatlán, Sinaloa, Mexico. Carnival is the most famous Brazilian holiday. During this time, Brazil attracts 70% of its tourists. Variations in carnival celebrations are observed throughout the multitude of Brazilian cities. Commonality observed among them is the incorporation of samba into the celebrations. The southeastern cities of Brazil have massive parades that take place in large sambadromes. The Rio Carnival is where two million people celebrate in the city. The city of Salvador holds a very large carnival celebration where millions of people celebrate the party in the streets of the city with a very big diversity of musical styles together. 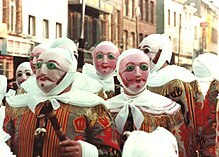 The celebration on the same day in Germany knows many different terms, such as Schmutziger Donnerstag or Fetter Donnerstag (Fat Thursday), Unsinniger Donnerstag, Weiberfastnacht, Greesentag and others, and are often only one part of the whole carnival events during one or even two weeks before Ash Wednesday be called Karneval, Fasching, or Fastnacht among others, depending on the region. In standard German, schmutzig means "dirty", but in the Alemannic dialects schmotzig means "lard" (Schmalz), or "fat"; "Greasy Thursday", as remaining winter stores of lard and butter used to be consumed at that time, before the fasting began. Fastnacht means "Eve of the Fast", but all three terms cover the whole carnival season. The traditional start of the carnival season is on 11 November at 11:11 am (11/11 11:11). The expedition, led by Iberville, entered the mouth of the Mississippi River on the evening of 2 March 1699 (new style), Lundi Gras. They did not yet know it was the river explored and claimed for France by René-Robert Cavelier, Sieur de La Salle in 1683. The party proceeded upstream to a place on the east bank about 60 miles downriver from where New Orleans is today, and made camp. This was on 3 March 1699, Mardi Gras, so in honour of this holiday, Iberville named the spot Point du Mardi Gras (French: "Mardi Gras Point") and called the nearby tributary Bayou Mardi Gras. Bienville went on to found the settlement of Mobile, Alabama in 1702 as the first capital of French Louisiana. In 1703 French settlers in Mobile established the first organised Mardi Gras celebration tradition in what was to become the United States. The first informal mystic society, or krewe, was formed in Mobile in 1711, the Boeuf Gras Society. By 1720, Biloxi had been made capital of Louisiana. The French Mardi Gras customs had accompanied the colonists who settled there. In 1723, the capital of Louisiana was moved to New Orleans, founded in 1718. The first Mardi Gras parade held in New Orleans is recorded to have taken place in 1837. The tradition in New Orleans expanded to the point that it became synonymous with the city in popular perception, and embraced by residents of New Orleans beyond those of French or Catholic heritage. Mardi Gras celebrations are part of the basis of the slogan Laissez les bons temps rouler ("Let the good times roll"). [not in citation given] On Mardi Gras Day, the Tuesday before Ash Wednesday, the last parades of the season wrap up and the celebrations come to a close with the Meeting of the Courts (known locally as the Rex Ball). Other cities along the Gulf Coast with early French colonial heritage, from Pensacola, Florida; Galveston, Texas; to Lake Charles and Lafayette, Louisiana; and north to Natchez, Mississippi and Alexandria, Louisiana, have active Mardi Gras celebrations. In the rural Acadiana area, many Cajuns celebrate with the Courir de Mardi Gras, a tradition that dates to medieval celebrations in France. St. Louis, Missouri, founded in 1764 by French fur traders, claims to host the second largest Mardi Gras celebration in the United States. The celebration is held in the historic French neighborhood, Soulard, and attracts hundreds of thousands of people from around the country. Although founded in the 1760s, the St. Louis Mardi Gras festivities only date to the 1980s. The city's celebration begins with "12th night," held on Epiphany, and ends on Fat Tuesday. 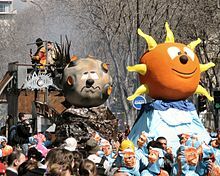 The season is peppered with various parades celebrating the city's rich French Catholic heritage. Mardi Gras, as a celebration of life before the more-somber occasion of Ash Wednesday, nearly always involves the use of masks and costumes by its participants. In New Orleans, for example, these often take the shape of fairies, animals, people from myths, or various Medieval costumes as well as clowns and Indians (Native Americans). However, many costumes today are simply elaborate creations of colored feathers and capes. Unlike Halloween costumery, Mardi Gras costumes are not usually associated with such things as zombies, mummies, bats, blood, and the like, though death may be a theme in some. The Venice tradition has brought golden masks into the usual round of costumes. Women exposing their breasts during Mardi Gras in New Orleans, US, has been documented since 1889, when the Times-Democrat decried the "degree of immodesty exhibited by nearly all female masqueraders seen on the streets." The practice was mostly limited to tourists in the upper Bourbon Street area. In the crowded streets of the French Quarter, generally avoided by locals on Mardi Gras Day, flashers on balconies cause crowds to form on the streets. In the last decades of the 20th century, the rise in producing commercial videotapes catering to voyeurs helped encourage a tradition of women baring their breasts in exchange for beads and trinkets. Social scientists studying "ritual disrobement" found, at Mardi Gras 1991, 1,200 instances of body-baring in exchange for beads or other favors. ^ a b Melitta Weiss Adamson, Francine Segan (2008). Entertaining from Ancient Rome to the Super Bowl. ABC-CLIO. In Anglican countries, Mardis Gras is known as Shrove Tuesday-from shrive meaning "confess"-or Pancake Day — after the breakfast food that symbolizes one final hearty meal of eggs, butter, milk and sugar before the fast. On Ash Wednesday, the morning after Mardi Gras, repentant Christians return to church to receive upon the forehead the sign of the cross in ashes. ^ "9 Things You May Not Know About Mardi Gras". History. Retrieved 8 January 2019. ^ a b c "Mardi Gras Terminology". "Mobile Bay Convention & Visitors Bureau". Archived from the original on 9 December 2007. Retrieved 18 November 2007. ^ Wilds, John; Charles L. Dufour; Walter G. Cowan (1996). Louisiana, Yesterday and Today: A Historical Guide to the State. Baton Rouge: LSU Press. p. 157. ISBN 978-0807118931. Retrieved 11 December 2015. ^ Bratcher, Dennis (7 January 2010). "The Season of Lent". Christian Resource Institute. Retrieved 25 June 2016. ^ "Mardi Gras in Bohemia-Prague". Retrieved 18 January 2016. ^ "Staročeský masopust Hamry". Retrieved 16 December 2017. ^ "Woher hat der Schmutzige Donnerstag seinen Namen?". Regionalzeitung Rontaler AG (in German). 17 February 2013. Retrieved 7 February 2015. ^ Killinger, Charles L. (2005). Culture and Customs of Italy. Greenwood Publishing Group. ISBN 978-0313324895. ^ "Swedish semla: more than just a bun". Sweden.se. Archived from the original on June 6, 2011. Retrieved February 22, 2011. ^ "9 Things You May Not Know About Mardi Gras". History.com. Retrieved 17 August 2017. ^ a b "Carnival/Mobile Mardi Gras Timeline". Museum of Mobile. Museum of Mobile. Retrieved 18 July 2012. ^ Geiling, Natasha. "Best Places to Celebrate Mardi Gras Outside of New Orleans". Smithsonian. Retrieved 11 February 2018. ^ Houser, Dave G. "7 big Mardi Gras celebrations (not in New Orleans)". chicagotribune.com. Retrieved 11 February 2018. ^ "Mardi Gras in St. Louis' Soulard Neighborhood". Retrieved 12 February 2018. ^ "12th Night | Soulard Mardi Gras 2018". stlmardigras.org. St. Louis, MO. Retrieved 11 February 2018. ^ Lisa Gabbert (1999). Mardi Gras: A City's Masked Parade. The Rosen Publishing Group. p. 4. ISBN 978-0-8239-5337-0. ^ A Mardi Gras Dictionary. Pelican Publishing. p. 6. ISBN 978-1-4556-0836-2. ^ J.C. Brown (2008). Carnival Masks of Venice: A Photographic Essay. AAPPL Artists & Photographers Press, Limited. ISBN 978-1-904332-83-1. ^ Sparks, R. “American Sodom: New Orleans Faces Its Critics and an Uncertain Future”. La Louisiane à la dérive. The École des Hautes Études en Sciences Sociales Coloquio. 16 December 2005. ^ a b Shrum, W. and J. Kilburn. "Ritual Disrobement at Mardi Gras: Ceremonial Exchange and Moral Order". Social Forces, Vol. 75, No. 2. (Dec. 1996), pp. 423–458.